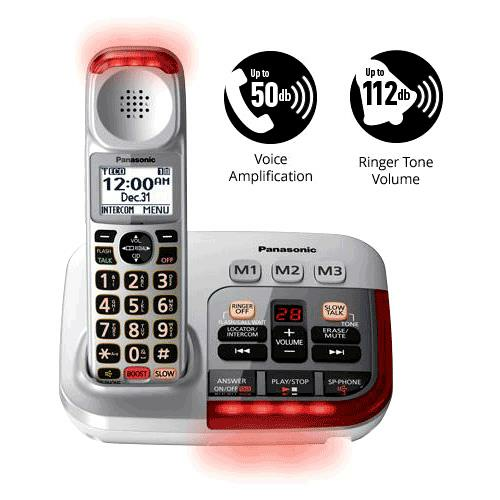 Panasonic KX-TGM450S Amplified Phone is a reliable and easy-to-use phone which improves many problem areas those with hearing loss struggle. 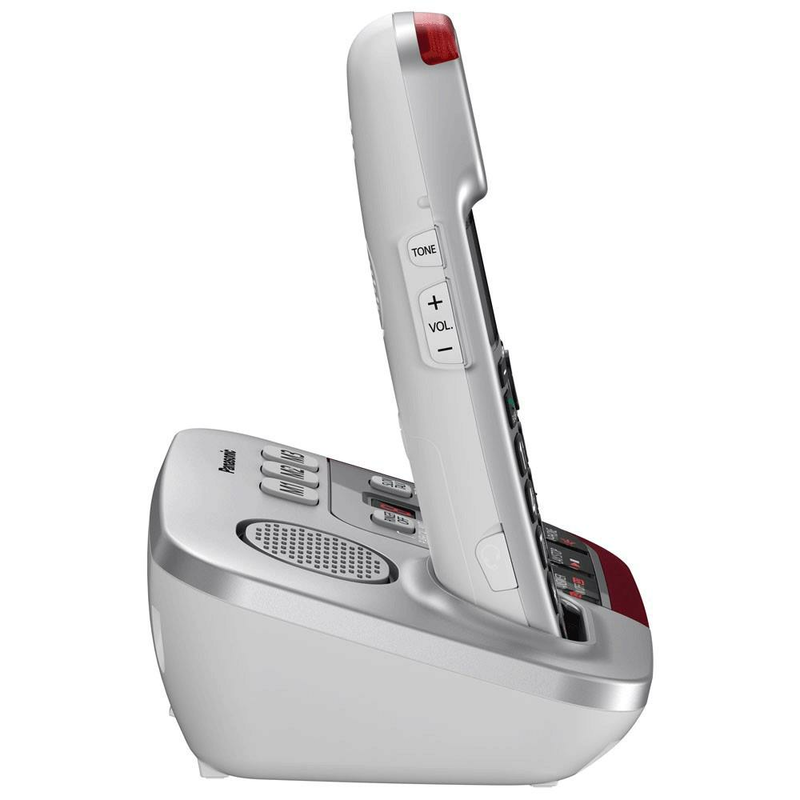 Speech is louder with 50dB amplification clearer with tone control and background noise reduction, fast talkers are better understood with slow talk control option on both incoming voice and answering machine messages, the user will always know when someone is calling. 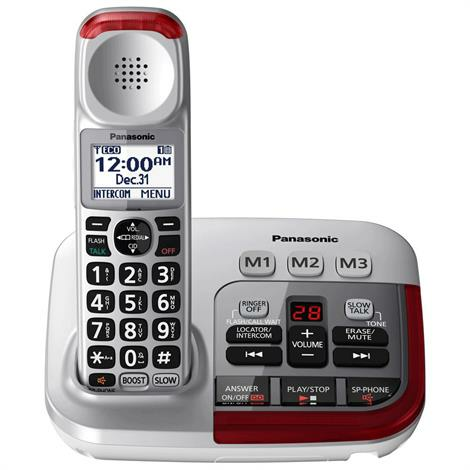 How To Use Panasonic KX-TGM450S Amplified Phone? - Two rechargeable Ni-MH batteries are installed in the base unit at the time of shipment. 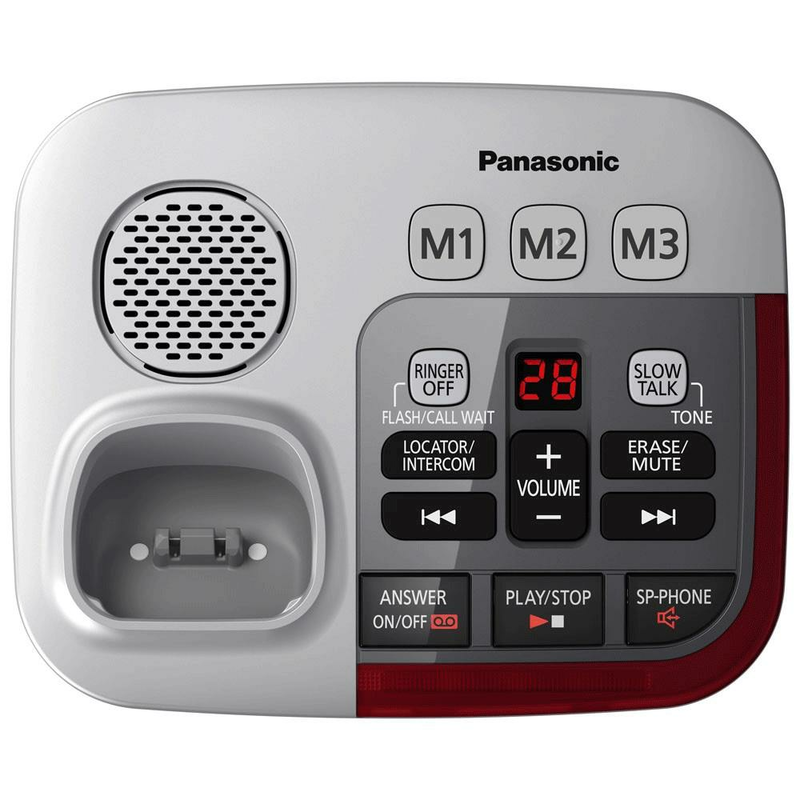 - Volume Boost control for amplified caller voice volume up to 50 dB, plus six-level voice Tone Settings and a loud base unit Ringer. 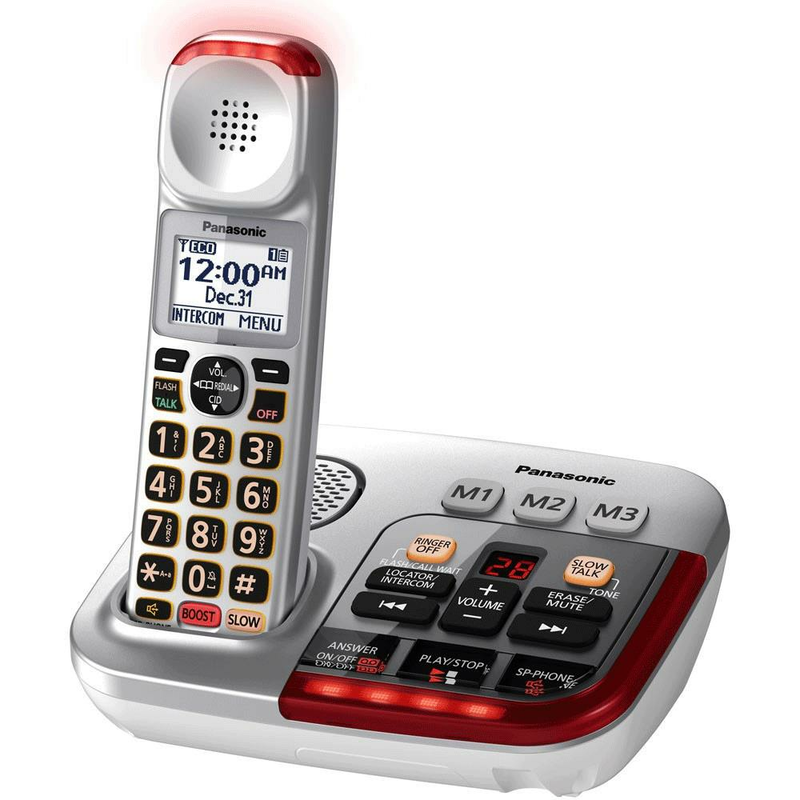 - To complement the systems 15 ringtone options, bright red LED visual ringers on the base unit and handsets also flash when someone calls, the KX-TGM450 system alerts the user, audibly and visibly of incoming calls, about the caller in English or Spanish. - Two built-in backup batteries in the base unit keep the user connected when the power goes out. 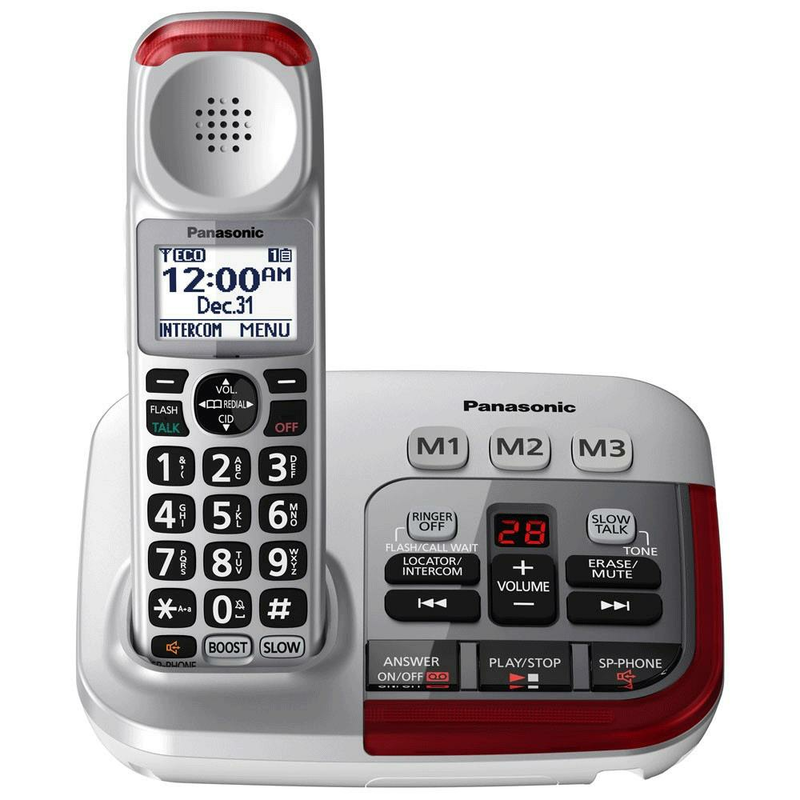 Fully charged batteries provide power for up to 13 hours of continues use and up to 9 days standby. Use only the power source marked on the product. Do not overload power outlets and extension cords. This can result in the risk of fire or electric shock. Completely insert the AC adaptor/power plug into the power outlet. Failure to do so may cause electric shock and/or excessive heat resulting in a fire. Regularly remove any dust, etc. from the AC adaptor/power plug by pulling it from the power outlet, then wiping with a dry cloth. Accumulated dust may cause an insulation defect from moisture, etc. resulting in a fire. Unplug the product from power outlets if it emits smoke, an abnormal smell, or makes an unusual noise. These conditions can cause a fire or electric shock. Unplug from power outlets and never touch the inside of the product if its casing has been broken open. Never touch the plug with wet hands. The danger of electric shock exists. To prevent the risk of fire or electrical shock, do not expose the product to rain or any type of moisture. Do not place or use this product near automatically controlled devices such as automatic doors and fire alarms. Radio waves emitted from this product may cause such devices to malfunction resulting in an accident. Do not allow the AC adaptor or telephone line cord to be excessively pulled, bent or placed under heavy objects. Unplug the product from power outlets before cleaning. Do not use liquid or aerosol cleaners. Do not spill liquids (detergents, cleansers, etc.) onto the telephone line cord plug, or allow it to become wet at all. This may cause a fire. If the telephone line cord plug becomes wet, immediately pull it from the telephone wall jack, and do not use. To prevent hearing damage, make sure anyone who uses this product is aware that the product can produce very loud sounds, and make sure children use this product only under adult supervision. To prevent hearing damage, we recommend that user set this product to the lowest volume setting at which user can hear adequately. Note that when the BOOST indicator is lit in red, the volume booster feature is enabled and the product may emit sounds at very high volume. Avoid prolonged exposure to loud sounds produced by this product. Be aware that the louder a sound is, the less time is needed to cause hearing damage. In the event that user experience hearing discomfort, consult a medical professional. Do not use this product near water for example, near a bathtub, washbowl, kitchen sink, or laundry tub, in a wet basement or near a swimming pool. Use only the power cord and batteries indicated in this manual. Do not dispose of batteries in a fire. Connect the AC adaptor to the unit by pressing the plug firmly. Fasten the cord by hooking it. Connect the AC adaptor to the power outlet. Connect the telephone line cord to the unit, then to the single-line telephone jack (RJ11C) until the user hears a click. A DSL/ADSL filter (not supplied) is required if user have a DSL/ ADSL service.